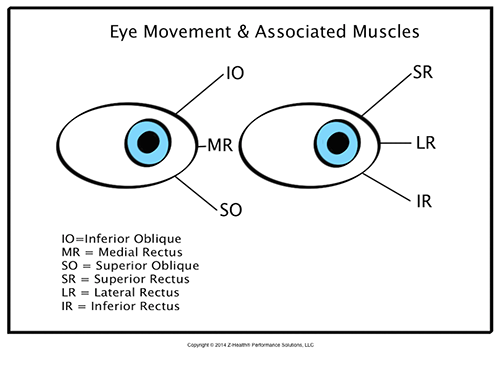 Understand the basic anatomy and function of the major extra-ocular muscles. 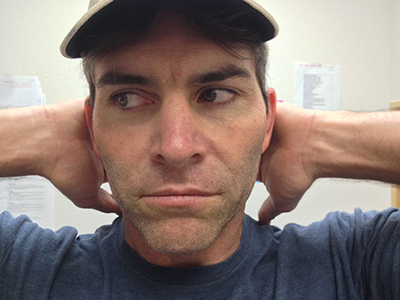 Explore the influence of eye movements on head and neck stability and mobility. Develop basic proficiency in teaching 4 primary vision training exercises. Learn basic assessment techniques to evaluate the influence of vision exercises on common fitness attributes: mobility, flexibility and strength. Would you ever feel comfortable telling a client to only do partial reps for a given body part forever? What do we know will happen if he follows this advice? Pay a horrible price in terms of total movement capacity as well as dramatically and permanently alter his joint mechanics. Plus as an added benefit, there’s a high likelihood that he would create a wonderful environment for a chronic pain syndrome of some kind. While every conscientious health and fitness professional would avoid these outcomes, many of us are inadvertently promoting this exact process in our clients whenever we fail to evaluate and train their visual system. After all, when is the last time you consciously did full range eye movements? For most people, the answer is not measured in hours or days, but in months or even years! And, the risk of this goes up with glasses, which can function as a “cage” for the eyes in terms of movement. At this point you may be asking if this topic REALLY MATTERS in a personal training environment? The answer is YES and it likely plays a much bigger role than you might think at first glance. So before you quit reading this article assuming it is for vision specialists and not personal trainers stay with me for a moment. How often do you deal with clients that complain of chronic neck tension headaches, shoulder tension and low back problems? The likelihood is that you see these things every single day of your working life. Many of these issues can potentially be caused by poor visual biomechanics (Bexander & Hodges 2012). Many of us in the health and fitness industry have been told about the importance of posture and biomechanics in the course of our training. However, many have grown very frustrated in trying to improve posture because the biomechanical approach that we were given rarely seems to work. We believe that the primary reason for this repetitive struggle is that movement and posture are primarily BRAIN-BASED, REFLEXIVELY-DRIVEN ACTIVITIES. This means that many postural deficits actually occur because higher order systems in the brain are failing to facilitate proper reflexive function in the body: and the eyes are prime example of this. When you study the biomechancis and neurology of the visual system what quickly becomes apparent is that your visual system is a primary driver and director of movement and coordination. This means that your visual system works very intimately with both your vestibular system and your proprioceptive system. Why this matters to MOST of us in our day-to-day work is the tremendous impact vision can have on spinal stability and function. Through a combination of work with your proprioceptive and vestibular systems, your vision helps in reflexively coordinating and controlling the stabilizing muscles of the spine through a variety of different pathways (Herdman & Clendaniel, 2014). Of particular interest for this article is what is known as the tectospinal tract. This is a neural pathway from a portion of the brain called the superior colliculus that connects the eye muscles with muscles of the upper neck. Research has shown that alterations in function or movement of the eyes can impact neck stability and movement and vice versa (Bear & Connors, 2006). In our work with thousands of clients, many of them have complained of years of neck, shoulder and upper back tension and movement limitation but virtually none of them have ever had their visual system addressed in relationship to their issues. This is a lot like saying, “The lights in my living room constantly flicker on and off. I keep changing the bulbs, but it doesn’t seem to really help.” The problem is likely not with the bulb, but somewhere else in the electrical system, and the same holds true for the body. We’ve been teaching about the impact of vision on movement for over 15 years and know from experience that this sounds so strange on first reading that fitness professionals often need a practical experience to help understand the real value of the information. If this is you, here’s a quick assessment that you can perform to literally FEEL the impact of eye motion on your neck. Palpate the suboccipital region as shown in the picture. Now while keeping your head still, quickly move your eyes first left and then right. 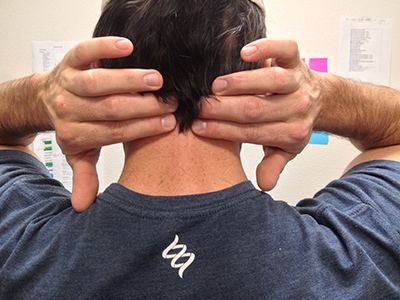 What you should notice is a reflexive activation of the sub-occipital muscles underneath your fingers. If you cannot feel it on yourself it may indicate that you have some issues! To be certain you understand what is supposed to happen, test this on several different bodies. In the beginning it’s quite simple. We want to make sure that our clients include some level of vision training in their workouts and daily lives. With a small amount of work, they can create significant changes over time in both eye muscle flexibility and strength, as well as improve reflexive spinal control. If we take a quick glance at the anatomy of the visual system, there are six primary extra ocular muscles that should allow us to have tremendous motion and control of our eyes. Here’s a chart that shows how the muscles work together to create what is termed conjugate gaze (Herdman & Clendaniel, 2014). This drill trains and exercises your ability to smoothly track objects in the full range of your visual field. Both visual strength and coordination are required to do this well. Stand in a comfortable position, feeling balanced and relaxed. Hold your finger, a pen or other visual target at arm’s length in front of your nose. While keeping your head as still as possible, focus on the end of a pen or your finger and make 3 big circles in each direction. 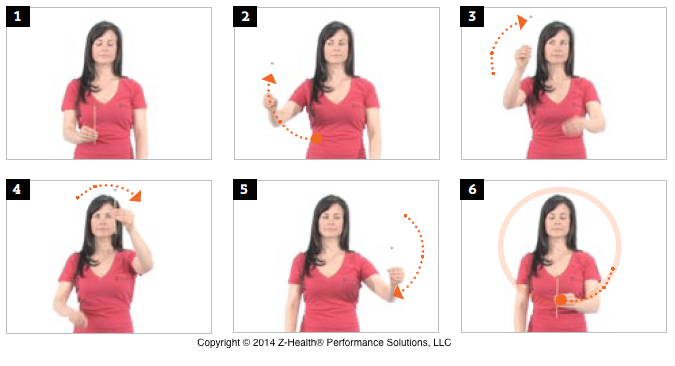 You may want to switch hands in the middle of the circle to make it easier to perform. While you are doing the circles, be aware of your breathing and body tension. Do a body scan and notice if you feel tension. If so, make the circles smaller and decrease the speed. Over time you should be able to do these at a variety of speeds and distances. Eye spirals are similar to eye circles but we are going to add some depth and movement to increase the challenge involved. Hold your finger, a pen or other visual target in front of your nose. 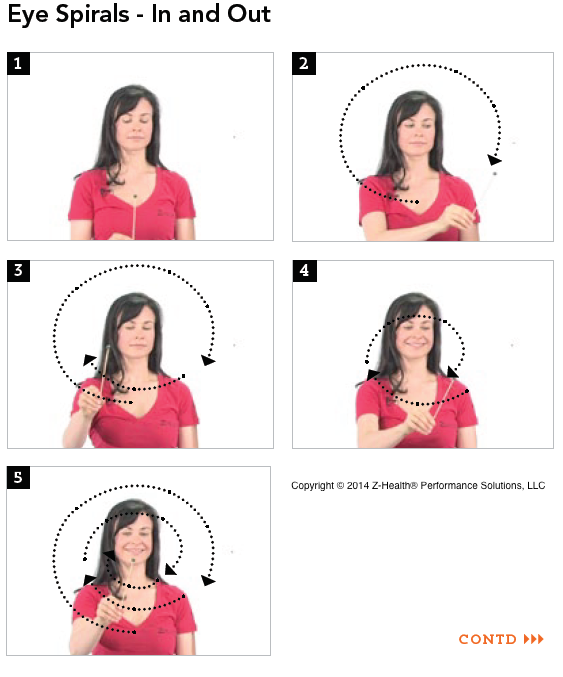 While keeping your head as still as possible, start making a circle close to you and while slowly moving away out to arm’s length, gradually increase the size of the circle. Allow 30 seconds to spiral away from you and about 30 seconds to bring the spiral back to you. Repeat #3 in a vertical direction. Start with your pen or finger near your navel; slowly spiral up until you are looking up. Repeat the spiral in the opposite direction, returning to the original position. 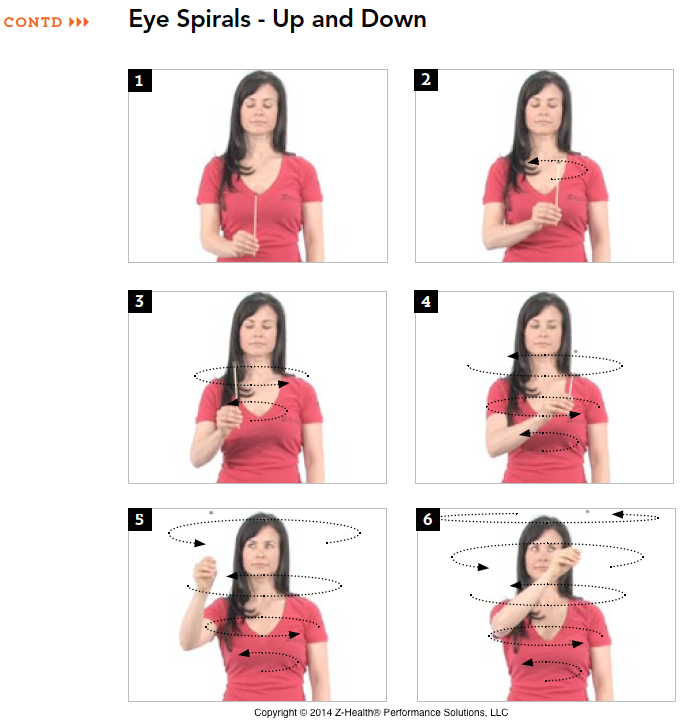 This drill purposefully practices the eye teaming necessary to clearly see and track objects that are near to you, and is especially important for reading. Hold a pencil or pen with the tip pointed toward the ceiling at arm’s length in front of your nose. Focus on the tip and slowly bring the pencil in toward your nose. Stop once the pencil tip doubles or you reach the tip of your nose. While maintaining focus follow the pencil back out to the original starting position. 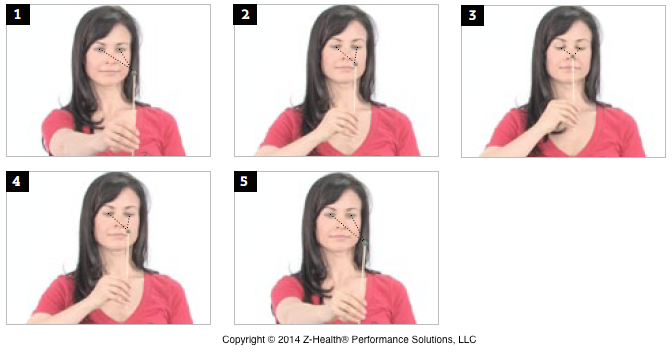 Do 3 to 5 repetitions with each hand. This drill is designed to shorten the time it takes for you eyes to adjust from looking at something close to looking at something farther away. 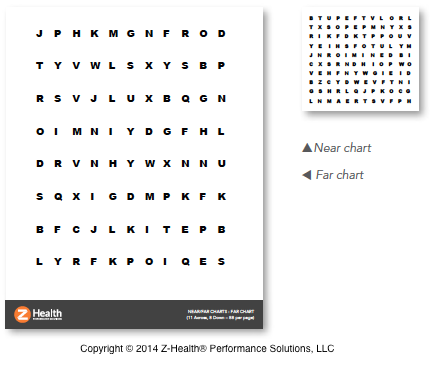 Place the large letter chart on a wall. Move back away from the large letter chart as far as you can and still see the letters comfortably. Stop at this point and take one giant step forward TOWARD the large letter chart and stand in a comfortable, relaxed position. Hold the small letter chart approximately 4-6 inches from your face, or as close as you can and still read the letter most clearly. It will need to be held off to the side (either right or left) slightly so that you can still see the large letter chart. Starting with the small chart, read the first 3 letters. Then look at the far chart and read the first three letters. Return to the near chart for the next three, and then look at the far chart. Repeat this process until you finish the chart or your eyes begin to fatigue. When you first begin teaching vision exercises to your clients many of them may wonder why they are doing it. In fact, if they have ever been interested in vision exercises before they were probably told by a well-meaning professional that training the eyes was impossible. Sadly, this is old information that does not correlate with current neuroscience research (Peters, 2012). This is a simple pattern to follow in both cases. For range of motion testing, we simply choose a set of range of motion tests (e.g. Shoulder Abduction, Shoulder Flexion, Shoulder IR/ER), perform them, then perform one of the eye exercises, and then reassess the ranges of motion immediately. In most cases, if the client performs the exercises well without causing too much brain stress, their ranges of motion will improve: often significantly. For strength testing, we first test a specific movement (e.g. KB overhead press) using a comfortable working weight and have the client give us an RPE (e.g. How difficult is that press on a scale of 1-10?) Then, perform a vision drill, then immediately reassess the lift. Again, in most cases, your clients will report that the lift became EASIER, meaning a lower RPE, after a vision drill. In most cases, when your clients can FEEL the impact of the exercises on their strength and movement, you have a much easier time keeping them motivated! In the emerging neuroscience of exercise and movement – the visual system is key. Luckily, we are also learning that anything that lives in the brain (like vision) can be trained over time with an intelligently applied approach (Doidge, 2007). Adding basic vision training is a fantastic addition to almost any training program that your clients may be undergoing and it sets you apart as a progressive thinker in the field that is always looking for new and better ways to help your clients reach their goals. Give it a try and let us know if you have any questions about application of these drills. Bear, M.F., & Connors, B.W. (2006). Neuroscience: exploring the brain (3rd ed.). Baltimore, MD: Lippincott Williams & Wilkins. Doidge, N. (2007). The brain that changes itself: stories of personal triumph from the frontiers of brain science. New York, NY: Penguin Group Publishing. Herdman, S.J., & Clendaniel, R. (2014). Vestibular rehabilitation (4th ed.). F.A. Davis Company. Peters, M.A. (2012). See to play: the eyes of elite athletes. Minneapolis, MN: Bascom Hill Publishing Group.